The smallest Deluxe Hardwired Solar Kit with big charging power at 5.6 Amps per hour under optimal sun conditions. Our 100 Watt Deluxe Hardwired Solar Kit is a perfect size for starting our with a solar battery charging system. 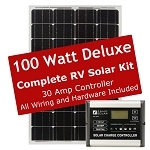 With our Deluxe 100 Watt RV Solar Kit there are still two extra available solar ports for adding more solar power from our Deluxe Expansion Kits. 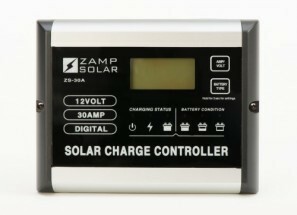 These deluxe solar kits are designed to hold a total of 480 Watts of solar power or up to 27 Amps of charging power. Digital display for voltage, current amps, and amps per period of time. LED Lights indicate operational status and battery charge status. Our wire is made of high quality and purchased from an American company – any wiring that needs to be done is wired at our Bend, OR shop.